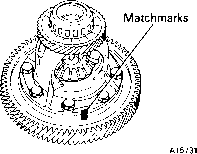 (a) Place the matchmarks on the ring gear and differential case. (b) Loosen the staked part of the locking plate. (c) Remove the eight bolts and four locking plates. 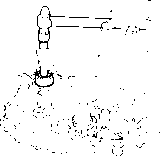 (d) Using a plastic hammer, tap on the ring gear to remove it from the case. 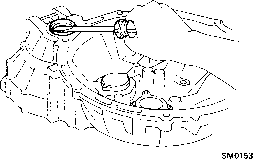 (a) Setting SST to the cut-out portion on the speedometer drive gear, remove the bearing from the differential case. (b) Remove the speedometer drive gear. 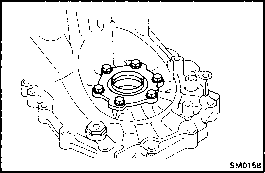 (c) Setting SST to the cut-out portion on the differential case, remove the bearing. (a) Drive out the pinion shaft lock pin from the ring gear side. 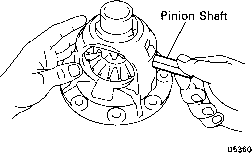 (b) Remove the pinion shaft from the case. 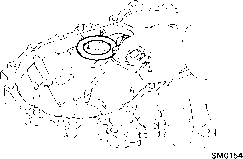 (c) Remove the two pinions, two side gears and four thrust washers. 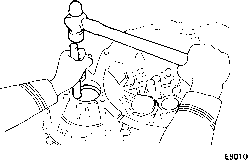 (a) Using a screwdriver, remove the oil seal. 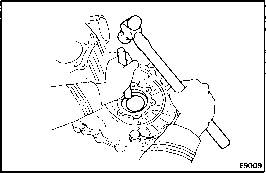 (b) Using a brass bar and hammer, drive out the bearing outer race lightly and evenly. (e) Using SST and a press, install the taper roller bearing outer race. (g) Coat the lip of oil seal with MP grease. 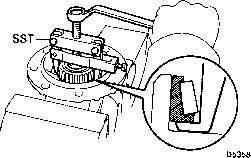 (b) Using SST, press in a new oil seal until its surface is flush with the case surface. (c) Coat the lip of the oil seal with MP grease. 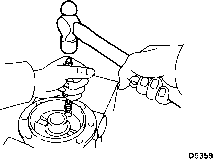 (a) Using a brass bar and hammer, drive out the bearing outer race tightly and evenly. 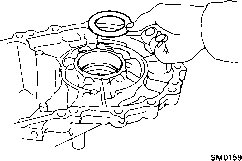 (c) Install the differential side bearing retainer without an O-ring. 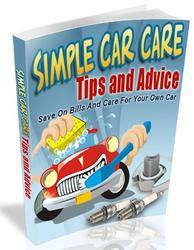 HINT: First select and install a shim of lesser thickness than before. (f) Using SST and a press, install the taper roller bearing outer race.